Objective In intensive care units numerous drugs have to be infused simultaneously, resulting inline incompatibility. Propofol is formulated as a lipid emulsion and it is well known that electrolytes can affect the stability of an emulsion system. Our goal was to evaluate and to compare the physical compatibility of three commercial propofol lipid emulsions of different manufacturers, mixing them with the most commonly used crystalloids in intensive care units. Methods Simulated Y-site administration was accomplished by mixing the 2% MCT/LCT propofol emulsions with the commonly used crystalloids in the intensive care unit in a 1:1 ratio in a polypropylene syringe. The aliquot samples were evaluated immediately and at 15, 30, 60 and 120 min after preparation by visual observation, pH and droplet size measurement. Results There was no emulsion breakdown or any visible change during the study period. Mixing the propofols with crystalloids, 10% magnesium sulphate or 10% potassium chloride there was no significant change in the droplet size compared with the original propofol emulsions. A slight alteration in droplet size was noticed in a few of the propofol samples, when magnesium, potassium or both were the secondary additives to the crystalloids, but this is not considered clinically relevant. Conclusion The physical properties of emulsions are determined by component, therefore the compatibility data in literature has to be evaluated prudently. All three commercially available MCT/LCT propofol emulsions are considered physically compatible with the tested crystalloids. Critically ill patients are treated with complex intravenous medications. The majority of the patients admitted to the ICU requires sedation for which mainly propofol is used. The most commonly used medications, beside propofol, are the opioid analgesics, antibiotics, vasopressors, antihypertensive agents. The use of crystalloids are also essential to ensure the adequate hydration of patients. Crystalloids are aqueous solutions of mineral salts or other water-soluble molecules. Despite of the presence of multilumen central vein catheter (CVC), different medications, including crystalloids, are often co-infused in the same line which may produce the likelihood of incompatibility. Incompatibility can involve precipitation, ionic reactions, evolution of gas and denaturation of biological molecules. This can cause decreased drug effectiveness or increased microparticle load with well-documented consequences, such as therapeutic failure, catheter occlusion or embolism.11–14 It has been previously reported that fat embolism occured, when propofol was mixed with lidocain.15 The compatibility of propofol with other drugs has been investigated by other authors, however, in these studies the LCT formulations of propofol (Diprivan and its generics) were tested, not the newer MCT/LCT formulation.16 To our best knowledge, there is no published data concerning the compatibility of MCT/LCT propofol and crystalloids, furthermore mixing of propofol with other infusions is not recommended by the manufacturers.5 6 17 Despite the warnings of manufacturer the co-administration of infusions is common in the clinical practice because of limited intravenous access. 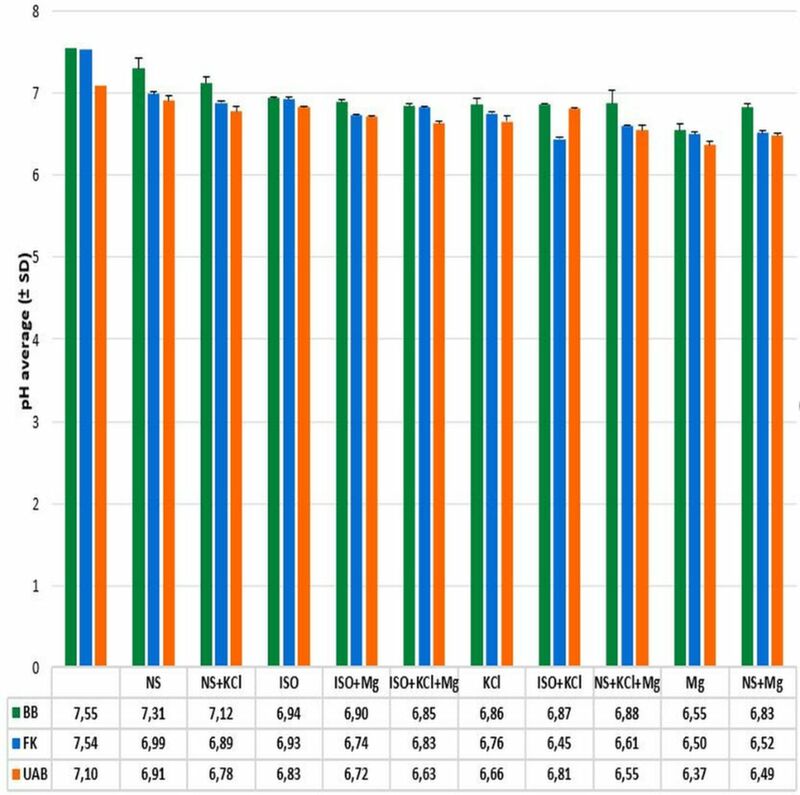 Our goal was to evaluate and to compare the physical compatibility of three commercial MCT/LCT propofol emulsions from different manufacturers, mixing them with the most commonly used crystalloids in the intensive care. Based on our stability results, we make conclusions on the use of mixtures in clinical practice. For this study we used three different propofol products and four crystalloids that are available on the Hungarian market. The propofol emulsions are manufactured by B.Braun (BB), Fresenius-Kabi (FK) and UAB Norameda (UAB). In the ICU 20 mg/mL (2%) propofol is used, therefore we decided to investigate this concentration. Compositions of commercially available propofol products and Diprivan (AstraZeneca) (which is not available on the Hungarian market) are compared in table 1. The electrolyte content of crystalloids are listed in table 2. The study samples were static admixtures of crystalloids and propofol with a ratio of 1:1 (v/v). First, a 5 mL sample of 2% propofol emulsion was combined individually with 5 mL of crystalloids, 5 ml of 10% magnesium sulphate (Pharmamagist Kft., Budapest) or 5 ml 10% potassium chloride (Pharmamagist Kft., Budapest) in a colourless 20 mL polypropylene syringe (B.Braun, Omnifix). Second, eligible amount of 10% magnesium sulphate and/or 10% potassium chloride was added to each crystalloids as a secondary additive making the final concentration 4 mg/mL. After this, 5 mL of samples were mixed with 5 mL of propofol emulsions in the syringes. In all cases the air was evacuated from the syringes, then the content was mixed by shaking. The samples were subsequently stored at room temperature (25°C) and in daylight in the laboratory. The pH and the mean droplet size distribution of all three propofols were measured on samples taken out of the original package. For the analysis of admixtures, 2 mL of mixed samples were taken out of the syringes immediately and at 15, 30, 60 and 120 min after preparation, and the following two measurements were done with all samples: pH and droplet size measurement. The pH values of samples were determined by a portable pH meter equipped with an inserting probe (Testo 206-pH2, Testo, Lenzkirch, Germany). The pH meter was calibrated using a solution of pH 4 and pH 7 before each measurement sample series. The volume based drop size distribution of the emulsions was measured by laser diffraction (Mastersizer 2000, Malvern Instruments Ltd., Worcestershire, UK) at room temperature (25°C) with the following parameters: 300 RF lens; small volume dispersion unit (2000 rpm); refractive index for dispersed particles 1.596; refractive index for dispersion medium 1.330. The size analysis was repeated three times. Glycerol-water 1:37 was used as dispersant medium. In all cases, the volume weighted drop size distributions, d(0.1), d(0.5), and d(0.9) (where for example d(0.5) is the maximum particle diameter below which 50% of the sample volume exists–also known as the median particle size by volume) were determined and evaluated. During the study the samples were inspected visually with unaided eye for obvious degradation of the emulsion and/or oil separation. There was no considerable difference in the pH of the three propofols when measured after being taken out of the original vials. After mixing with crystalloids, the pH of samples were, according to the original pH of crystalloids, between 4.37-7.31 (figures 1 and 2). 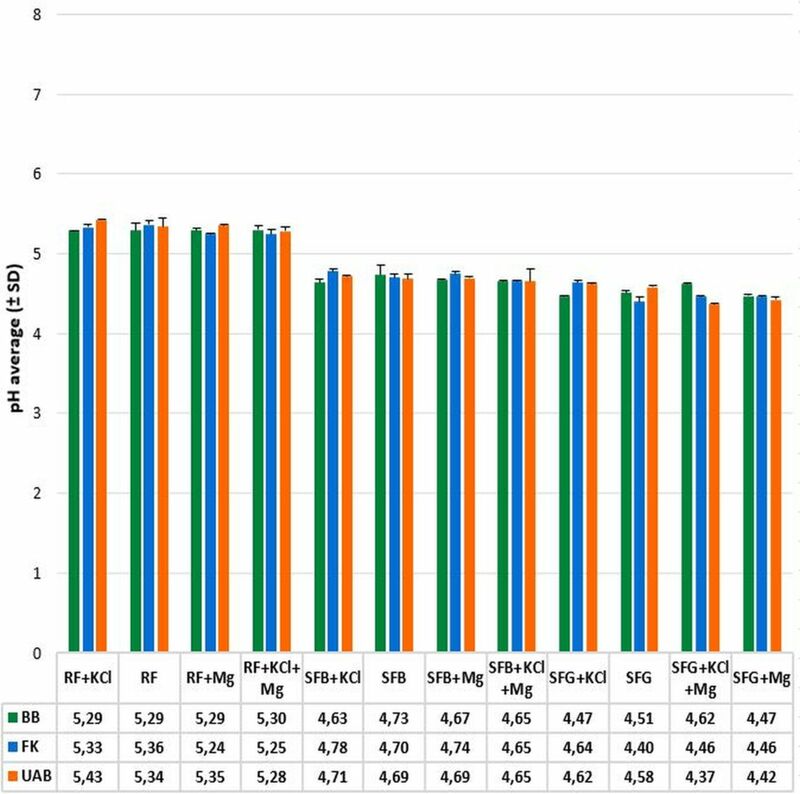 The admixtures of the Sterofundin B (SFB) and Sterofundin G (SFG) resulted in the lowest pH, due to the fact that these infusions originally had a lower pH, which is needed to prevent decomposition of their glucose component during autoclaving. The mean droplet size of all three propofols were measured and taken out of their original packages resulting in no significant difference: BB 0.133 µm, FK 0.136 µm and UAB 0.135 µm, respectively. The effect of crytalloids to droplet size of propofol emulsion are summarised in figure 3. Mixing all three propofols with 10% magnesium sulphate or 10% potassium chloride there was no change in visual appearance and in droplet size despite high electrolyte concentration. Furthermore, there was no alteration when mixing the propofols with crystalloids. When adding potassium chloride to Ringerfundin (RF) and SFB there was a slight alteration in the droplet size of propofol of FK and there was no detectable visible change in any of the mixed samples. The addition of both magnesium and potassium to the crystalloids did not result in change in the droplet size when it was mixed with the propofol of B or UAB. There was considerable increase in the droplet size when the propofol of FK was mixed with RF and potassium and magnesium was added, but the droplet size remained below 1 µm. Lipid emulsions are thermodynamically unstable, therefore their stability is important for safely administering infusions. Physical incompatibility, precipitation of particles or growth of droplet, is more relevant for Y-site administration than chemical incompatibility, because of the short contact time.11 Both precipitates and enlarged oil droplets can cause fatal emboli and harm to the liver and lungs.11–14 Furthermore, the droplet surface area decrease can cause alteration in the release of propofol in vivo due to the enlarged droplet size.18 The quality and safety of lipid emulsions has been identified, uniquely among pharmacopoeia, in the United States Pharmacopoeia (USP) since 2007. The USP standards require that the volume weighted percentage of fat with droplet diameter above 5 µm (PFAT5) should be ≤ 0.05%.19 Although lipid emulsions have been in clinical use for more than 50 years there is no standardised procedure or consensus to which test should be accomplished to evaluate their compatibility. Therefore, various methods have also been used to investigate their stability, most commonly the visual observation, pH, droplet size and zeta potential measurement. According to a recent study the best practice testing compatibility of lipid emulsions and intravenous drugs is the combination of these methods.20 One of the important factors what is considered to determine the emulsion stability is the pH, since the H+ ions can alter the droplet charge by adsorption to the surface. The average pH values of the propofol and crystalloids mixtures. BB, B.Braun propofol, FK, Fresenius Kabi propofol, UAB, UAB Norameda propofol, NS, 0.9% sodium chloride, ISO, Isolyte, RF, Ringerfundin, SFB, Sterofundin B, SFG, Sterofundin G, Mg, 10% magnesium sulphate, KCl, 10% potassium chloride. The average pH values of the propofol and crystalloids mixtures (cont.) BB, B.Braun propofol, FK, Fresenius Kabi propofol, UAB, UAB Norameda propofol, NS, 0.9% sodium chloride, ISO, Isolyte, RF, Ringerfundin, SFB, Sterofundin B, SFG, Sterofundin G, Mg, 10% magnesium sulphate, KCl, 10% potassium chloride. Droplet size change of propofol after mixing with crystalloids. BB, B. Braun propofol, FK, Fresenius Kabi propofol, UAB, UAB Norameda propofol, NS, 0.9% sodium chloride, ISO, Isolyte, RF, Ringerfundin, SFB, Sterofundin B, SFG, Sterofundin G, MgSO4, 10% magnesium sulphate, KCl, 10% potassium chloride. The practice of safe infusion administration is necessary particularly when simultaneous infusions are to be co-administered. The critically ill patients are exposed to a higher likelihood of medication incompatibility because of a high number of drug combinations.This study showed that the investigated MCT/LCT propofol injectable emulsions are physically compatible with 10% magnesium-sulphate, 10 % potassium-chloride and different composition crystalloids (0,9% NaCl, Isolyte, Ringerfundin, Sterofundin B, Sterofundin G) during a two-hour period. In the clinical practice, administration of these combinations via Y-site are safe. In the literature there are many chemical and physical compatibility data on LCT propofol in combination with often co-administered medications through the same infusion system. It is known that the presence of monovalent or divalent cations can destabilise emulsions by neutralising the repulsive negative charges on the droplet surfaces, leading to the physical instability of emulsions. 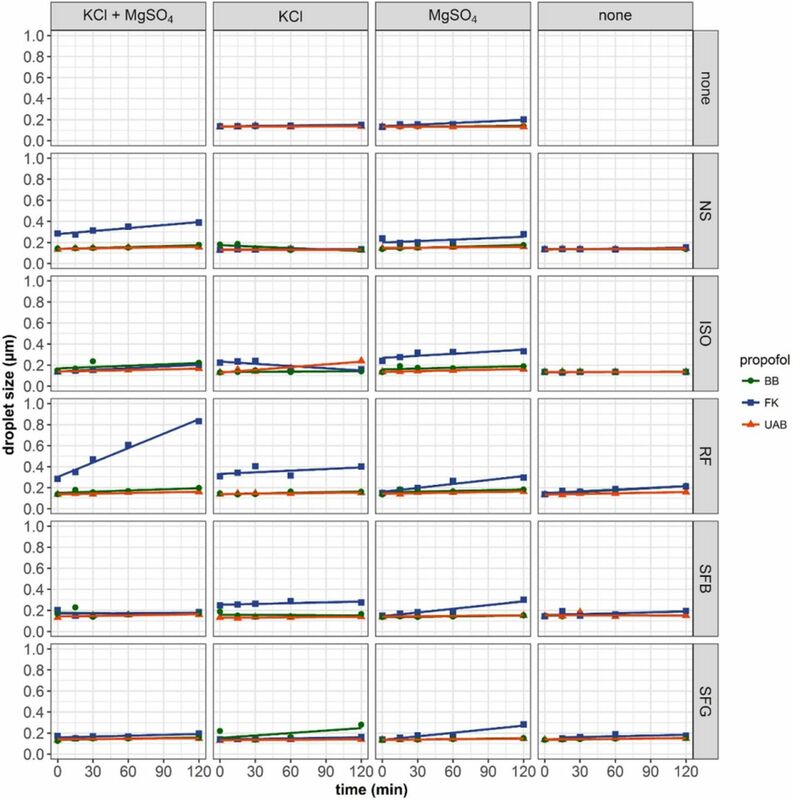 This study displays the physical compatibility of several clinically relevant combinations of MCT/LCT propofol with commonly used crystalloids and electrolytes in the intensive care units. The co-administration of MCT/LCT propofol with the tested crystalloids through the same infusion line is safe. Diprivan 1%. Summary of Product Characteristics. https://www.medicines.org.uk/emc/medicine/2275 (accessed 24 Jan 2017). PROPOFOL 2% MCT/LCT FRESENIUS – Summary of Product Characteristics. 2017. https://www.ogyei.gov.hu/gyogyszeradatbazis/index.php?action=show_details&item=22 (accessed 24 Jan 2017). PROPOFOL-LIPURO 20 mg/ml – Summary of Product Characteristics. https://www.ogyei.gov.hu/gyogyszeradatbazis/index.php?action=show_details&item=24 (accessed 24 Jan 2017).
. Thermodynamics of emulsion formation and breakdown. In: Tadros TF ed. Emulsion Formation and Stability. Germany: Wiley-VCH, 2013.
. Fat embolism associated with anesthesia induction with propofol-lidocaine combination: a case report. Med J Trakya Univ 2008;25:52.
. Compatibility of propofol injectable emulsion with selected drugs during simulated Y-site administration. Am J Health Syst Pharm 1997;54:1287–92. UAB Norameda – summary of product characteristics. https://www.ogyei.gov.hu/gyogyszeradatbazis/index.php?action=show _ details&item=34 (accessed 24 Jan 2017).
. Propofol: the challenges of formulation. Anesthesiology 2005;103:860–76. U.S. Pharmacop. Globule Size Distribution in Lipid Injectable Emulsions, 2014:360–3. Isolyte (freseniuskabi) – Summary of product characteristics. https://www.ogyei.gov.hu/gyogyszeradatbazis/index.php?action=show details&item=31 (accessed 24 Jan 2017). Ringerfundin (B Braun) – Summary of product characteristics. https://www.ogyei.gov.hu/gyogyszeradatbazis/index.php?action=show_details&item=23 (accessed 24 Jan 2017). Sterofundin B (B Braun). Summary of product characteristics. https://www.ogyei.gov.hu/gyogyszeradatbazis/index.php?action=show_details&item=12 (accessed 24 Jan 2017). Sterofundin G (B Braun). Summary of product characteristics. https://www.ogyei.gov.hu/gyogyszeradatbazis/index.php?action=show_details&item=12 (accessed 24 Jan 2017). Contributors GSZ and GK planned and conducted the study and carried out the laboratory investigations. MM edited the figures. OJL and PD supported the conduction of the study.